I admit that I had no plans for photographing the solar eclipse today. Here in San Diego, at the maximum of the eclipse 83% of the sun was obscured by the moon. A few hundred miles to the northeast of us, one would have seen an annular eclipse. The only difference to a total solar eclipse is that the moon is too far away from the earth, so its apparent size is too small to completely cover the sun, and a “ring of fire” remains. When the eclipse started, I projected images of the sun through a pin hole in an index card. Nothing worth photographing, but at least I was able to see the moon taking its bites out of the sun. As it was getting closer to the time of the maximum eclipse, the marine layer started coming in. 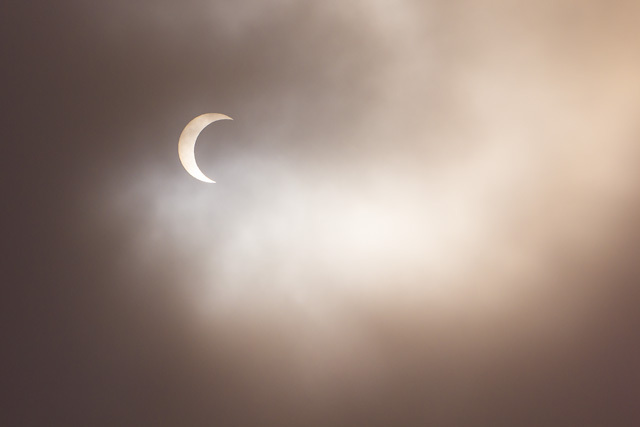 At first I was disappointed, but then I realized that at times the cloud layer was of just the right thickness that it was safe to directly look at the eclipse! Sometimes, a presumed misfortune turns out to be a stroke of good luck! This entry was posted in Picture of the Week and tagged canon eos 60d, eclipse, nature, outdoors, photography, solar eclipse, sun. Bookmark the permalink.